Remember when you were a kid and parks had all of the coolest things to play on? I remember my uncle taking me to the park by my grandparents house. It had metal monkey bars that erased your fingerprints in the summer, a metal slide that seared through your way-too-short shorts, and long wooden teeter totters that always managed to pepper your bottom with splinters. It also had a merry-go-round type thing with metal bars. My brothers and I would hold on, and my uncle would spin it as fast as he could. Eventually we would go flying off and/or jam some joint (elbow, knee, crotch) on the metal bars. Yes, those were the good old days. Trust - Will my sister drop me like a bad habit? One of my favorites was the teeter totter (or seesaw for my readers across the pond). All kinds of fun games came from those, but unfortunately since most of those games ended in a cracked head or a broken arm they are seldom found in parks now. 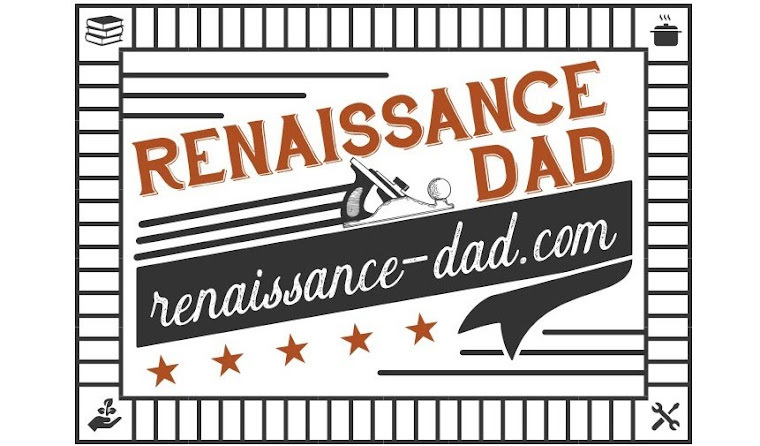 So what is a Renaissance Dad to do...? Make one, of course. Before I go on, I need to give the standard warnings. Like anything that kids get their hands on, they can get hurt on a teeter totter. They can also get hurt having a pillow fight, putting rocks down each others' pants (yeah, that really happened), or jumping from the couch to the coffee table while playing "The Floor Is Lava." So please use discretion and supervise your kids. While this is not an instructional, step-by-step as to how to make a teeter totter, you can see by the pictures that the design is quite simple. It is made from two eight-foot 2X6 boards and one eight foot 4X4 redwood post. I used the redwood post because redwood is naturally moisture resistant and insect resistant, and I figured that if it can handle those two things, it should be able to handle my three kids. This also means that it does not need to be painted. The 2X6 boards were painted using some left over exterior paint. Two boards make up the legs and two boards make up the uprights. There are two spacer blocks between the uprights to give space to the post, which is attached using a threaded rod with locking nuts holding it in place. Two board cutoffs make up the seats, and the handles are made from 2X2 scraps with round dowels running through the tops. You will also notice in the picture from the side that there is a hole above the pivot point. When I originally built this that upper hole was the pivot point. Then I realized that my then three-year-old was about five feet in the air. I modified and moved the pivot down, which lowered the maximum height. I can still move it up to daredevil level in their older years. The whole project took me about two hours to cut and put together, not including the time to paint it. One thing I realized is that the handles do not work really well. The kids put so much torque on the handles that they regularly break off. A little more engineering with longer lag screws, anchor sleeves, and some wood glue solves this problem. However, if I had it all to do over again, I might choose simple rope handles. All of which leads me to this realization: some projects, especially ones that are tested out by kids, need to be fixed and modified on a regular basis. This is part of the wonderful world of engineering for kids who operate outside the realm of normal physical constraints. This is part of being a Renaissance Dad. I am a money guy. I shop sales, I look for deals, and I try not to spend money when I don't have to. So when I looked at the initial investment that cloth diapers required, I just about threw up. Was my wife seriously expecting me to drop $500 up front on diapers? That is insane. And then the logical side of me took over. The average American family spends between $1000 and $1500 per year or more on disposable diapers, depending on the brand, with organic or green brands being even more expensive. That means that in three years of disposable diapers, a child can easily burn $3000 or more. So $3000 spread out over three years for disposable diapers, or $500 up front cloth diapers? This was my turning point, and the moment I realized that I could handle cloth diapers (I wasn't even calculating the savings for kids two and three. Cha-ching). My wife and I decided that, if we were going to use cloth diapers, we would want to purchase a new washer and dryer and remodel our laundry room. And you know what, that initial investment was still less than what we would have spent to keep Big E in disposable diapers for her first three years. So I still wasn't completely on-board with disposable diapers, but the logical, financial side of me realized that this was the way to go. I was worried about the smell. But I quickly realized that the diapers were not smelly when kept in a Simplehuman Slim Plastic Step Can with a washable pail liner. I realize that is overly specific, but if you are considering cloth diapers, trust me, the can is a game-changer. If we ever felt they were smelly between washings we could just sprinkle a cup of baking soda over the diapers to absorb the smell. Easy. Then I had to overcome the thought of dealing with poop on diapers. Again, not something that I miss at this point, but something that I realized was not too bad. My father-in-law and I fabricated a diaper sprayer by connecting a good old-fashioned kitchen sprayer to the toilet supply line. After changing a poop diaper, we held on to the cleanest corner we could find and sprayed the poop into the toilet. No big deal. Now the most magical benefit of all. When Big E was 18 months old, we were visiting family. She looked at us and said, "Pee pee." I questioned her, she repeated herself, and I took her to the potty. She went! No prompting, no trying to persuade her, no bribery (although that came later). She took the initiative. And all three of our kids have potty-trained by two-years old. Why? Try strapping a soggy towel to your mid section and see if you don't want to get out of it as quickly as possible. While there are other benefits to cloth diapers, for this Renaissance Dad the biggest benefit was the financial. I eventually came to realize the other benefits, but the financial advantages were what initially convinced me. I would encourage any other parents out there to look at the benefits, weigh them out, and e-mail me if you still need to be convinced. By the way, part of our good experience with cloth diapers was due to Meredith at Go Go Natural. She has a huge selection of everything imaginable related to diapers, and she was really helpful in guiding and advising us when we were first learning the ropes. If you are even considering thinking about considering cloth diapers, I encourage you to chat with Meredith (by the way, she doesn't sponsor my blog. Just giving a shout out where it's due)! My wife and I got a front load washer six-and-a-half years ago, just before Big E was born. We replaced our old washer and dryer, knowing that with the money we would save with cloth diapers we could buy a more efficient washer/dryer combination. We decided to go with a front load washer, knowing that we would save money due to the low water usage, and anticipating having our kids entertain themselves by watching the washing when they say, "I'm bored." However, as anybody who has ever owned a front load washer can tell you, there are times when the washer starts to smell...a little bad. There are things that you need to do - keep the door propped open, occasionally wipe down the gasket - just to keep the washer from smelling funky. However, even when following the washing machine protocol, there are times when the washer still smells bad. In more than six years of owning the washer, there have been three times when the smell has affected our clothes. Each of these times I have considered calling somebody to come service the machine, but have decided to troubleshoot the problem myself. And each of these times I have discovered the cause and have been able to easily remedy it myself. The first thing to try is running a load of hot bleach water. If the machine needs more help, run a cloth over every nook and cranny you can find, especially on the inside and outside of the rubber gasket at the front. My wife found lots of hidden stinky slime with this technique. If the smell still remains, it's time to get out the power tools. So here is what to do if your front load washer smells bad and cleaning it following manufacturer's recommendations doesn't seem to work. By the way, this is for a Maytag Epic front load washer, but my research has shown me that many front load washers are similar in design. 1). Locate the screws holding the lower front panel on. Remove these screws using a long bit on a driver, or using a long manual socket driver. For my washer, there are two screws on either side of the bottom of the lower panel. Set the panel and screws aside. 2). Look for the clean-out. For the Maytag, it is a simple quarter-turn cap. 3). Place a towel under the washing machine to catch the water that drains out. Turn the cap, remove the clean out, and find that sock that has been missing for months. Yes, occasionally a sock, a coin, or other treasures make their way through the screens and end up in this catch. This is typically where the bad smell comes from. Please note, depending on how long this sock has been in the clean out, you may not want to do this right after eating. The smell can be overwhelmingly wretched. 4). Return the cap, making sure it is secure. Replace the front panel, return the screws, and enjoy the smell of fresh, clean clothes. 5). Brag to your significant other about how you de-funked the washing machine and made the whole house a better place to live. Feeling of satisfaction at finding the culprit for the stench: Priceless.